Emerson, Muir, Thoreau; these are the three people that Far From Noise's creator, George Batchelor, explicitly credits with inspiring his philosophical treatise in interactive form. Those three might not be household names, but either it's all a remarkable coincidence, or they are three of the leaders in the transcendentalism philosophical movement, in a game that is a rigorous examination of transcendentalism. It may be a coincidence, but I doubt it. Evocative and poignant, interesting and utterly beautiful, Far From Noise is perhaps closer to theatre than a videogame, and while that means certain elements of the gaming community will dismiss it instantly, it's something I found to be incredibly powerful. 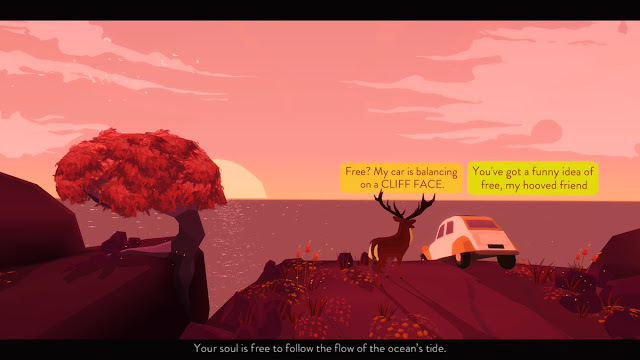 The game starts with a scene of a car, teetering on a cliff edge, rocking gently back and forth, and likely to go over the edge at any moment. Though we don't see her, inside the car is a girl, who is unable to actually get out because of the way the car is precariously balanced. She has little choice but to sit there and hope for the best (one presumes in this scenario she doesn't have access to a mobile phone). There she is, swaying back and forth, simply waiting for the moment the car finally slips off the rock it's swaying on. We can only assume how terrified she must be. Then a deer appears, walks up to the car, and starts a conversation with the girl. Either she's hallucinating out of sheer terror, or this is one of those pieces of drama where animals are spiritual beings and can talk. It doesn't really matter why, though. What's important, is the nature of the conversation that the two have as they sit and wait for what seems like the inevitable. They turn to discuss the meaning of life, basically. While you're waiting for death that is a conversation that's worth having. 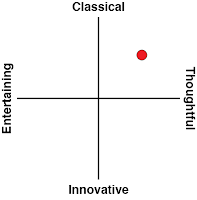 I'll admit that as much as I love my philosophy, transcendentalism is a blind spot. I know it's rooted in Kantian philosophy and argues the idea that divine truth can be known intuitively. I know that Emerson - the same fellow named as an "inspired by" in the credits (I assume), was the one that basically kickstarted the whole idea, and the individualism that is so characterised by American culture is very much reflected through his work. Emerson's basic principle was to "trust yourself" and opposes the reliance on social structures (whether civil or religious) on principle. The ultimate idea being that a person should approach the divine directly and on their own terms, rather than being being mediated to that point through some institution. 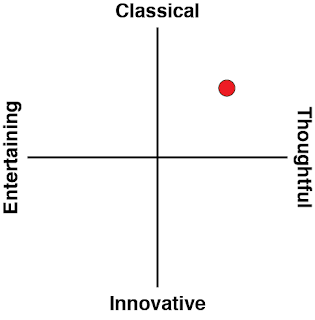 Beyond that I'm fairly ignorant of the school of thought, but I'm going to go out on a limb and assume that transcendentalism is reflected accurately and with integrity in Far From Noise. It's a game with a so brilliantly written and thought-provoking narrative that I can only assume - lacking in knowledge in the philosophers that drove it - that the writer knows exactly what he was on about. Individualism - and therefore transcendentalism - is in many ways on the other side of the fence to the philosophy movements I follow, but I did find all this fascinating enough that I've now gone and purchased some of Emerson's work. And so, regardless of whether I end up agreeing with its insights that this game and movement posit, I was certainly inspired by it all. What I will say is that there's a strong undercurrent of existentialism to Far From Noise, whether intended or otherwise, and that is certainly my beat. Nietzsche, Sartre and Kierkegaard are my philosophical posse, and I found that many of the questions that the game asks are very must related to the work of these great minds. Sitting there on the edge of the cliff and feeling like doom is inevitable is certainly a good place to start thinking "was it all worth it?" and "is it worth clinging on? ", and I think the additional waves of terror that the girl feels when the wind picks up or a storm, threatening to hasten the car being dislodged from its perch, is poignant to this question. 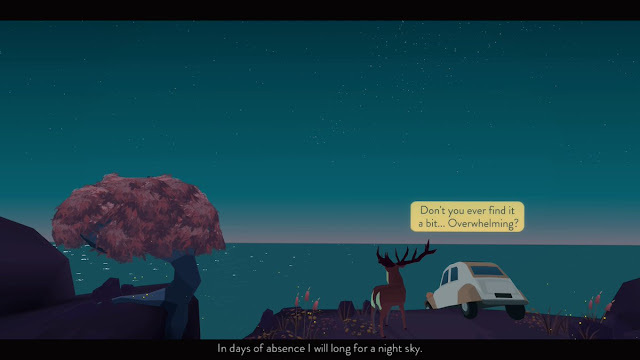 Beyond that, Far From Noise is also a game which is about waiting, and contemplating. My immediate response to it was to mentally compare it to the absurdist masterpiece of theatre, Samuel Beckett's Waiting For Godot, which too is a story that predominantly occupied by two individuals simply waiting, and having a conversation about the point of it all. Absurdism itself, of course, is closely related to existentialism in the way that it argues the fundamental absurdity of trying to seek meaning in life. Just as in Waiting For Godot, in Far From Noise there are moments of humour as the absurdity of it all boils over, but name of the movement aside, absurdism isn't really about humour, and Far From Noise is less about joking and more about reflecting. 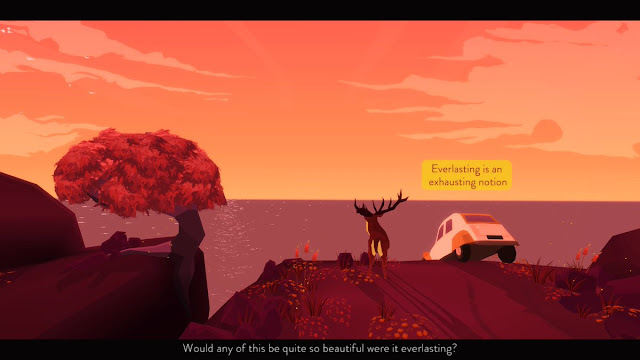 This is all what I got from the game, regardless of whether it was intended to break away from being an interactive lecture on transcendentalism or not, and that's the beauty of a great piece of art, such as this game; how each person will respond to it is different. There's such a density of ideas and thought that has going on in the game that simply engaging with its own debates, and deciding whether you agree with them or not, is enough to muse over for a good long time. 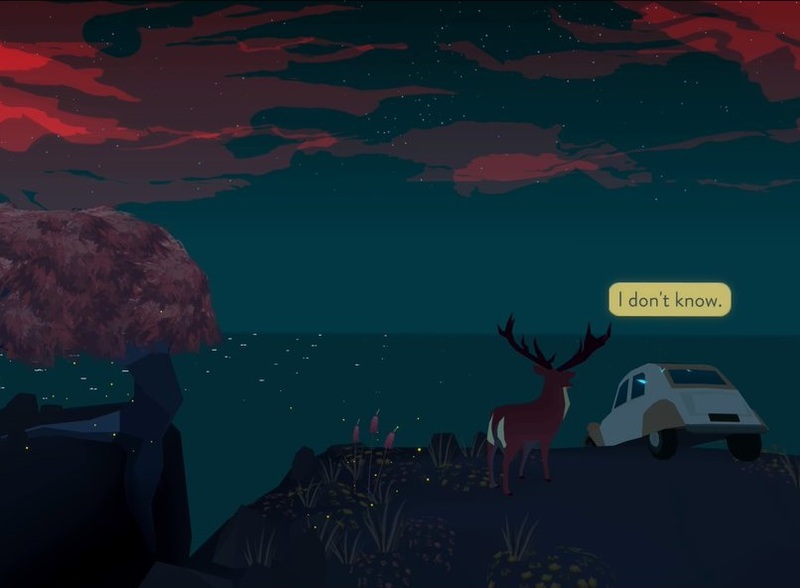 The only "gameplay" in the game is in being able to select from a couple of different dialogue options as the woman talks to the deer. These different effect that these decisions have are themselves incredibly subtle, but designed to carefully steer you into thinking about things from a certain perspective. Indeed, you'll need to replay the game a couple of times because those decisions also affect what scenes you experience through the game, and I did notice with each replay that, very gently, the game's tone with me shifted with each direction that I took it. And then Far From Noise leaves you with a completely ambiguous ending. The ending itself is an obvious binary (and it's not a plot spoiler to say that she either falls off the cliff or does not), but the way that's presented will itself leave you with questions, and yet another reason to think. It's truly masterful stuff, and I've rarely experienced a game so close to actual theatre in tone as this one. Reinforcing the theatrical nature of it is that the game effectively takes place on the one "set." That scene that you're seeing in the screenshots is the entirety of the game, much like how most theatre plays out against a single backdrop. Tonally, this is something very different for games - even amongst the super-artsy "genre" that Far From Noise belongs to. But it's effective in the same way that theatre sets are; they set the scene and then get out of the way. Aside from when the environment becomes the bouncing board to reinforce what the game's talking about, that setting completely fades from perception soon after you start playing, and it does so because you'll be focused on reading the words of the text and dialogue popping up onto the screen. It's beautiful for a single-scene set, though, utilising a deliberately low-polygon aesthetic that is both refined and elegant, while allowing for enough personality in the car and animals that appear on screen to give it all some character. Similarly minimalist music further reinforces this game's theatrical tone, and as a major fan of theatre (if you haven't guessed by now), I find this to be a very self-evidently good thing. I love Far From Noise. It's one of my highlights for the year. Not as a game - because it's barely a game. I love it because it's genuine bona fide art, made with that explicit intent and, importantly, successful at it. It's a game that weaves a masterful story, and would only really work as interactive art, because ultimately, what this game is about is a conversation... and it wants to hear your answers as much as it wants to pose questions to you.